Terrorist apologists are out in open hiding behind the #AdarshLiberal mask. A plethora of uninformed nonsense is flying around among those who have no knowledge of the law, no regard for facts and no respect for the Apex Court. Ketan C Bhate ( @BhateKetan) in a series of tweets thrashes all the nuisance flying around and suggests to revisit the Supreme Court judgment on Yakub Abdul Razak Memon, the Terrorist. The conviction & death sentence of Yakub Memon was confirmed by The Supreme Court after thorough scrutiny of both “facts & law”. The voluminous judgment runs into 790 pages. The SC noted that in our jurisprudence, a sentence depends upon the gravity of role played by the convict. 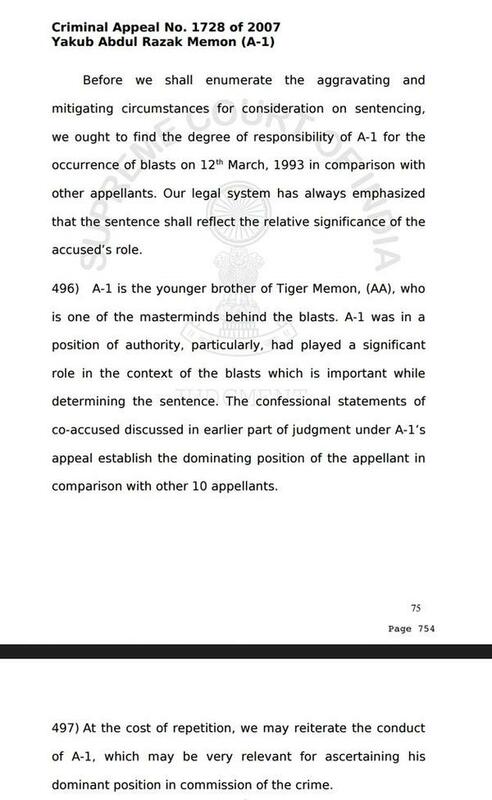 Here, A1 refers to Yakub Memon, who was in a position of dominant authority and played a significant role in executing the heinous crime of Bombay Blasts which took lives of 257 innocent Indians (Para 496). 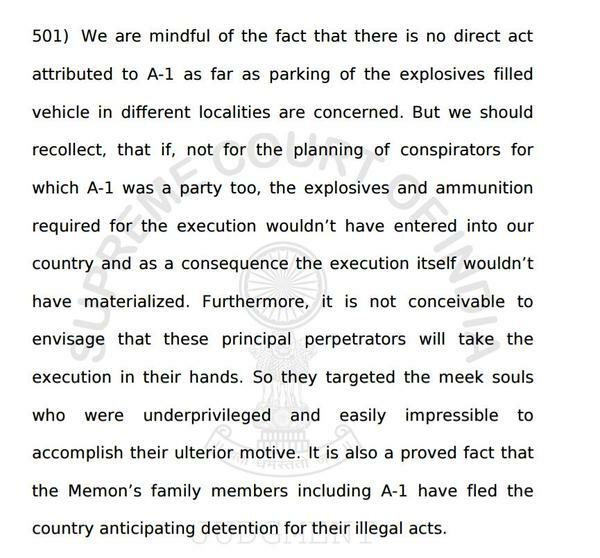 As per this SC judgment, other convicts were asked by Tiger Memon to stay in touch with Yakub for further instructions regarding the blasts. Para 498. Yakub Memon assumed the role of Tiger Memon in India during his absence. Yakub was Tiger’s most trusted man being his brother. Tiger Memon gave commands directly to Yakub Memon, who in turn gave commands to other convicts. So, Yakub was a key player who also performed the task of handling explosive bags & kept the explosives safe for blasts. Para 498 b.
Yakub Memon actively performed Hawala transactions to facilitate money for the blasts and also made travel arrangements for other convicts for the purpose of their training to carry out bombings. 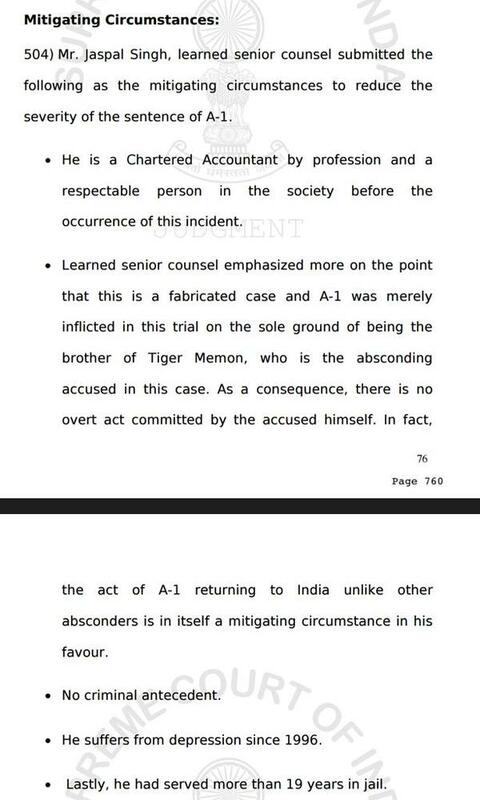 Yaqub was found equally responsible for explosions as his younger brother Tiger Memon. Supreme Court held him to be the architect and the driving spirit behind the plan of the blasts. 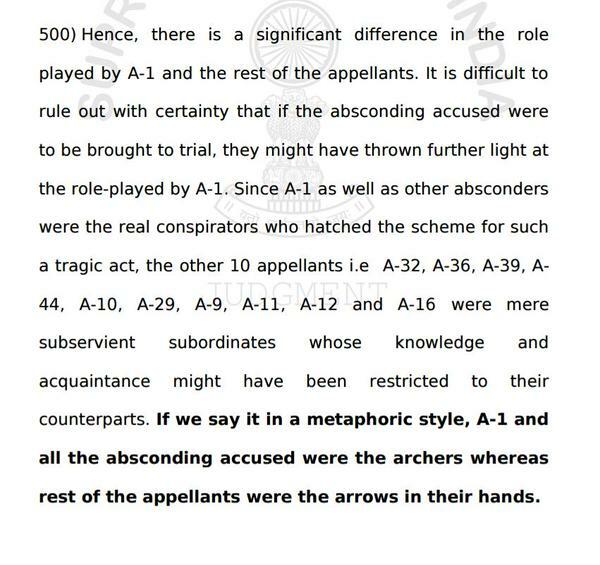 Without Yakub, blasts would have never seen the daylight, observed the SC in Para 499 of its judgment calling him “”archers of the blasts”. Without planning of Yakub and other conspirators, explosives & ammunition used in bombings wouldn’t have entered India, neither the blasts would have taken place. The Apex Court conclusively found that Yakub was in dominant position & directly responsible for the bomb blasts. It was Yakub along with other perpetrators, who consciously used meek, underprivileged men to execute their plan of blasts. Yakub fled the country along with other family members to evade clutches of Indian law. 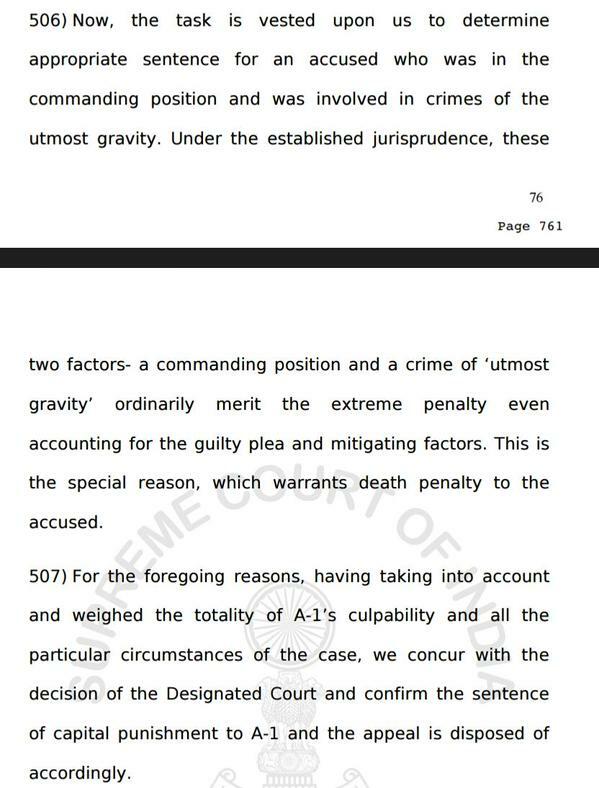 The Supreme Court noted aggravating circumstances against Yakub Menon while justifying death sentence upon him. The SC conclusively found that Yakub was was one of the main brains behind hatching larger conspiracy of Bombay Blasts. He targeted vulnerable, defenceless victims. To inflict maximum damage, it was Yakub who deliberATELY chose highly populated places like sites of the blasts, how gruesomely diabolical! His crime was of one with “extreme depravity”, observed SC. The SC also took into account the severity of pain & suffering inflicted on victims to justify the death sentence. There are hollow and mollifying circumstances in favor of Yakub as argued by his counsel, which didn’t impress the SC at all. The return of Yakub to India was canvassed before the SC to oppose the death sentence, but the SC found no merit in the argument. So, the argument of return to India has already been unsuccessfully used by Yakub’s counsel in the SC. His sympathizers are suggested to find some other excuse if at all exists. 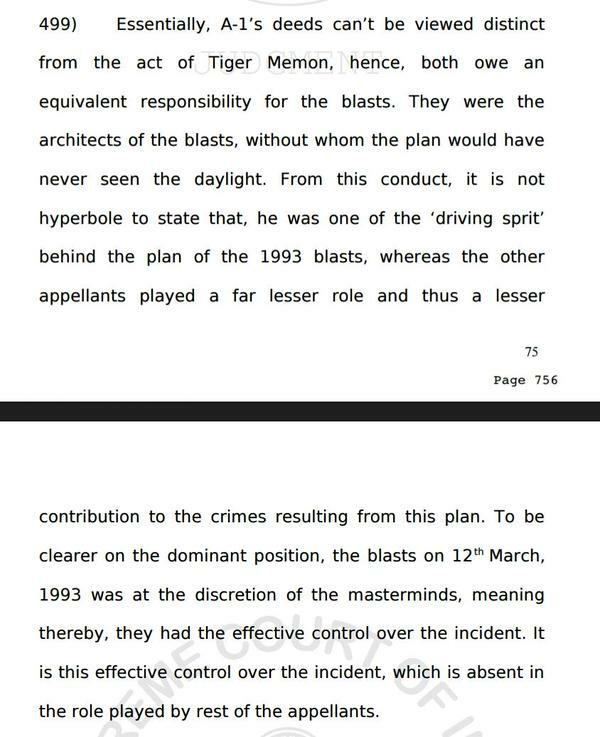 The SC judgment conclusively smashes the argument that Yakub didn’t play a vital role in the blasts or that his crime was less grave. Further, the SC ruling explicitly states active & pivotal role of this perpetrator against India in carrying severe bomb blasts over Indian citizens and debunks all arguments that he wasn’t directly involved. In Indian jurisprudence, a commanding position and utmost gravity of crime warrants extreme punishment. A painstakingly written 790-page Supreme Court judgment that has been questioned by sketchy, hurriedly written tweets and op-eds by the same usual suspects with barely any fact or merit. Yakub Abdul Razak Memon is guilty of the most ghastly crime in independent India’s history, and his role was direct and pivotal. Hanging is the least he deserves. His hanging certainly deserves a celebration. TANU weds MANU Retrurns: An engaging hilarious drama !! OROP is done, now spreading the ‘sense of injustice’ is dangerous ! !